WordPress 5 uses the new Gutenberg block editor (also called the Standard Editor) by default. You can still use the Classic Editor, which is what used to just be called the WordPress editor. As of WordPress 5, if you wish to continue to use the Classic Editor, you must install it as a plugin. This article contains the instructions for accessing the Beaver Builder editor from both the WordPress block editor and the classic editor UI, and from other locations in the WordPress admin panel or admin bar. Note: There is an increasing number of third-party (not from Automattic) classic editor plugins. If you want to disable Gutenberg entirely, we've found that both of the Disable Gutenberg plugins work with Beaver Builder. Most of the other plugins have been untested with Beaver Builder. If you are using a third-party plugin to restore the classic editor and have a problem not described here, please file a Beaver Builder Support ticket so that we can document the problem and any possible workarounds, or list it as incompatible. Note: If you want to edit a Post layout in Beaver Builder, you need to enable Posts as a post type in the Beaver Builder settings. See the article about Beaver Builder settings. When you create a page or open an existing page in the WordPress block editor, you'll see a choice to either launch Beaver Builder or use the Standard (Gutenberg) editor, as shown in the following screenshot. Note: Due to a longstanding bug in WordPress, if you have used an ampersand character (&) in your Beaver Builder content instead of the character entity (&amp;), when you click Edit for an existing Beaver Builder page, it will open directly in Gutenberg with a warning that there is invalid content. For example, if you have a heading such as "M&Ms" in a Heading module, changing it to "M&amp;Ms" will resolve the issue. Create a new page or open an existing page for editing in WordPress and click the Beaver Builder tab, as in the following screenshot. Note: If you don't see the Beaver Builder tab, one way to make it appear is to force the use of Classic editor rather than the Gutenberg editor. On the WordPress admin panel, go to Settings > Writing and select No for Allow users to switch editors. 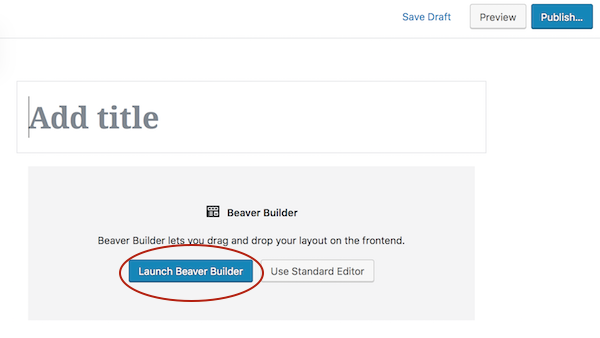 If you want users to continue to have a choice of WordPress editor for each page or post they create, use any of the other methods described here to open the Beaver Builder editor. Mouse over a page in the Pages > All Pages list, then click the Beaver Builder link. Tip: When a Beaver Builder layout already exists for a page, the Beaver Builder link is followed by a green button, as you can see in the screenshot. When a Beaver Builder layout hasn't been created yet, it's followed by a pale gray or white button. If you're viewing a page and you're logged in, the WordPress admin bar appears on a large screen, and you can click the Beaver Builder link to edit the page. When a Beaver Builder layout already exists for the page, the Beaver Builder link is followed by a green button, as you can see in the screenshot. When a Beaver Builder layout hasn't been created yet, it's followed by a pale gray button. Tip: After the page is open for editing in Beaver Builder, you can watch a video with tips on how to create a layout. Click the down arrow in the title bar in the upper left corner of the editing page to expose the Tools menu. Choose Help and then start the video that's displayed.